Farnborough, UK | July 16, 2014– Rockwell Collins today announced it has reached a major milestone in implementing a complete take-off-to-touchdown advanced information management solution as Cathay Pacific begins operational evaluation of the company’s eEnabled Aircraft Solution on three Boeing 777-300ER aircraft. Working in collaboration with Cathay Pacific, Rockwell Collins is designing and supporting the implementation of a common aircraft network across Cathay Pacific’s fleet of B777, B747-400F, B747-8, and Airbus A330 aircraft as well as Dragonair’s A330 and A320/1 aircraft. The network will serve as a full-time global air-to-ground data communication and information management service, supporting both current and future high-speed connectivity. Rockwell Collins, with Cathay Pacific, has the only eEnabled fully integrated and regulation-compliant aircraft solution flying today. Rockwell Collins’ ARINC eEnabled Aircraft Solution allows for secure information management of flight operations, data communication services, cabin services, maintenance, diagnostics and vital safety information throughout flight, enhancing operational efficiencies and reducing costs. It improves accuracy of fueling requirements, provides potential for increased payload, and allows for automatic upgrades of installed and portable electronic flight bags. AIX, Hamburg | April 9, 2014– TAAG Angola Airlines has become OnAir’s first Sub-Saharan African customer – line fitting its new B777-300ER fleet with Internet OnAir and Mobile OnAir. 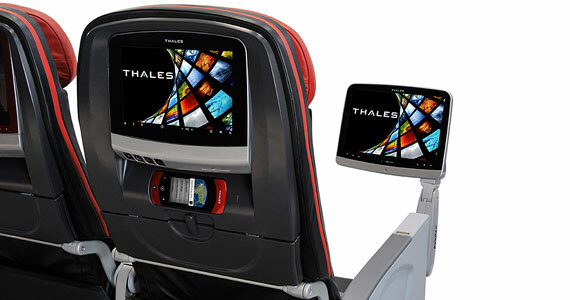 The airline will use Thales’ TopConnect to access OnAir’s inflight Wi-Fi and mobile phone services on its new fleet, to be delivered from May 2014. OnAir offers a consistent, reliable service across Africa and all the routes the airline flies, thanks to the widest-reaching network of regulatory approvals and the largest and most geographically diverse number of roaming agreements of any provider. With authorizations from over 100 countries and more than 375 roaming agreements, OnAir provides consistent coverage on all the major routes across the world. In addition, OnAir uses Inmarsat’s SwiftBroadband satellite network, the only network to provide worldwide coverage. Passengers flying on TAAG Angola’s B777-300ER will experience the full benefits of OnAir connectivity. The inflight Wi-Fi solution, Internet OnAir, enables passengers to email, update their social media, and browse news sites. Like a Wi-Fi hotspot on the ground, passengers only need to log on and their enter credit card details before they are free to surf the Internet. Passengers can also use OnAir’s inflight GSM product, Mobile OnAir, to email, text, talk, and use their mobile apps as they please. Charges are included in the user’s monthly phone bill, exactly like using international roaming. Two Significant Events in the Same Day! Thales had a milestone event today in the first delivery announcement of the latest Thales TopSeries AVANT in-flight entertainment and connectivity IFEC system. As launch customer for the newest system, China Southern selected “the world’s most advanced Thales passenger system”. Why is it important? In case you have been asleep for that last few months you have not seen the aircraft manufacturers predictions that half the worlds traffic growth will occur in the Asia-Pacific region. Indeed, the market for aircraft (and thus IFEC systems) looks to be a whopping 13,000 aircraft to the tune of almost $2 T… that’s Trillion! At a ceremony held today at the Boeing facility in Seattle, China Southern took delivery of the first Boeing 777-300ER aircraft equipped with the new generation Thales TopSeries AVANT in-flight entertainment and connectivity (IFEC) system, making China Southern the launch customer for the world’s most advanced Thales passenger system. China Southern is the largest airline in Asia by fleet size and the fifth largest airline in the world by number of passengers. Thales already equips the airline’s Airbus A330 aircraft with its IFEC systems and will now install the award winning AVANT system on all 10 Boeing 777- 300ER scheduled to enter into service for the airline between 2014 and 2016. The first of these aircraft will fly from Seattle back to the airline’s main hub in Guangzhou, Baiyun International airport where it is scheduled to enter into regular service on March 2nd, between Guangzhou and Shanghai Hongqiao. It is believed that China Southern will use the Boeing 777-300ER to fly direct between Guangzhou and New York. The fourth-generation TopSeries AVANT system is ideal for all commercial aircraft types. Its unique design eliminates the electronics box under cabin seats, thereby improving passenger comfort and enhancing weight efficiency. China Southern will benefit from the system’s scalable design which will allow the airline to offer significant differentiation between classes, such as single touchscreen in economy and interactive multi-screen in business. The AVANT system is also based on the Android operating system, which accommodates a wide range of both off-the-shelf and airline-specific applications. Why the latest press release from Panasonic release is worth reading: The following excerpts from today’s announcement from Panasonic, to the best of our knowledge, is the first mention of tying in airline operations, aircraft health conditioning, crew ops, EFB, maintenance operations, airplane conditions, and weather in one package…not to mention one terrific information/entertainment service package. Although these functions and their bundling have been discussed for years, this is the “Big Apple” of connectivity and delivers the payoff of a problem noted in the early nineties by the President of Douglas Aircraft when he stated that only node in the airline network not automated was the airplane itself! Singapore Airlines has signed a memorandum of understanding (MOU) with Panasonic Avionics Corporation (Panasonic) to explore opportunities to leverage Panasonic’s Global Communications Services to change the way it conducts business. Enhance the passenger experience with greater levels of personalization, more robust infotainment. Panasonic and Singapore Airlines also announced a long term Power By The Hour Maintenance Contract covering the maintenance, repair and support of Panasonic IFE equipment through 2024. The Singapore based Panasonic and SIAEC Joint Venture, Panasonic Avionics Corporation Services Singapore (PACSS) will play a central role in the execution of this agreement. The contract further enhances ties between the two industry leaders.